Serving a range of industrial applications, actuators and valves have emerged as the essential components that can control the flow of semi-solids, liquids and gasses for increasing the efficiency of industrial processes. Increasing penetration of industrial automation has further necessitated the use of actuators and valves. Petrochemicals, pharmaceuticals and automotive – among the world’s highly profitable industrial verticals are showcasing a growing demand for actuators and valves. Manufacturing sector is also witnessing a growing uptake for actuators and valves, and these components are being used to successfully automate and process and control the pipeline operations. Transparency Market Research’s latest forecast study on the global actuators and valves market projects that the demand for actuators and valves will witness steady traction in the years to come. According to the report, the global actuators and valves market will expand at an estimated 5.3% CAGR in terms of value during the forecast period, 2017-2026. The report further reveals that by the end of 2026, the global actuators and valves market will surpass a valuation of US$ 511 Bn. A product-based analysis of the global actuators and valves market has been developed in the report, findings from which forecast a soaring demand for quarter turn valves and pneumatic actuators. In the near future, hydraulic actuators are expected to lose traction over pneumatic actuators as the latter’s efficiency in fluid power applications is recognized as a key advantage. In addition, the effective role of pneumatic actuators in sustaining overload pressure conditions will further propel their sales in the global actuators and valves market. Likewise, the competitive advantage of quarter turn valves in offering bi-directional operability is extending their application scope. The adoption of quarter turn valves is expected to gain traction in the years to come. The report estimates that by the end of 2026, over US$ 78 Bn worth of pneumatic actuators will be sold across the globe. By the end of the forecast period, the global sales of quarter turn valves is estimated to translated into US$ 85 Bn in terms of revenues. The report has further estimated that in 2018 and beyond, the application of actuators and valves in oil & gas industry will account for highest share of global market value. By the end of 2026, more than US$ 100 Bn worth of actuators and valves are expected to be used in oil & gas applications worldwide. The report also observes the Asia-Pacific excluding Japan (APEJ) region as the most lucrative marketplace for adoption of actuators and valves. High presence of crude oil producers, with China dubbed as the region’s largest oil producer, coupled with robust growth in automotive and pharmaceuticals industries, is expected to drive the growth of the APEJ actuators and valves market through 2026. By the end of the forecast period, the APEJ actuators and valves market is estimated to touch US$ 215 Bn valuation, reflecting the highest volume CAGR of 5.9% over the forecast period. The report has profiled companies namely, Honeywell International Inc., AVK Holdings A/S., Flowserve Corporations, Schlumberger Limited, Emerson Electric Co., Tyco International Ltd., KITZ Corporation, Burkert Fluid Control Systems, Watts Water Technologies, Inc, and Rotork Plc. as the key players in the global actuators and valves market. These companies are expected to instrument the global production of actuators and valves in the foreseeable future. Adopting new designs to extend the application purview of actuators and valves will be a key strategy of these market players. In addition, several actuators and valves manufacturers will be integrating advanced sensors and smart technologies to enhance the functionality of these components and capture new growth opportunities in the future. Rapid growth of the wastewater and water treatment industry has created enormous demand for actuators and valves over the past few years. The surge in the urban population worldwide has proliferated demand for water that is safe for consumption. Although several developed nations possess well-established water treatment infrastructure, lack of proper distribution facilities has resulted into water contamination at the time of transportation, thereby putting pressure on the water treatment facilities. Governments around the world are therefore concentrating on improvement of their water treatment facilities and distribution channels, which in turn will influence demand for actuators and valves in the near future. Transparency Market Research has recently published a comprehensive research study on the global actuators and valves market. The report encompasses present market scenario, and also imparts future growth prospects of the global actuators and valves market for the period between 2017 and 2026. The report also engulfs key drivers, hindrances, opportunities and trends that are affecting expansion of the global actuators and valves market. 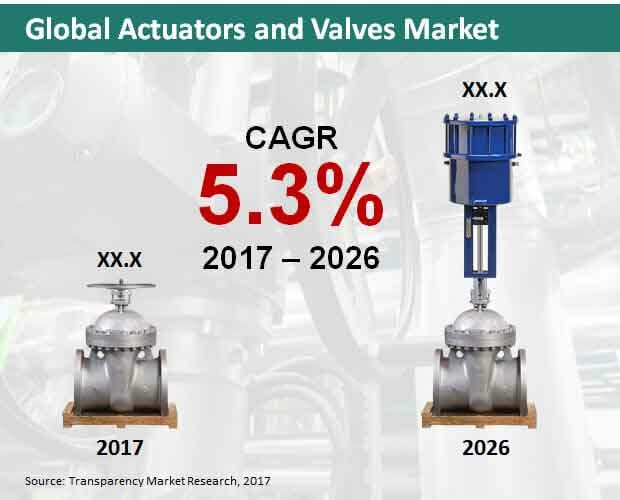 The report offers an overall picture of the global actuators and valves market, in order to help businesses seeking opportunities for making investments in the market. The report provides an exhaustive synopsis of the global actuators and valves market, engulfing an executive summary that elucidates the core trends influencing the market expansion. This chapter also sheds light on impacts that the dynamics are likely to pose on growth of the market in the long run. The report also imparts figures appertaining to CAGRs from a historical and forecast point of view. An overview of the global actuators and valves market follows the executive summary, and issues a clear picture of the market’s scope to the report readers. The overview includes a concise market introduction succeeded by a formal definition of “actuators and valves”. Chapters subsequent to the overview elaborates several dynamics including driving factors, limitations and prospects being observed in the market through the forecast period. Meanwhile these chapter also inundate detailed insights related to the bottom line of enterprises, global economy and fiscal stimulus. A segmentation analysis offered in the report propounds forecasts on global actuators and valves market. Categorizing the market in terms of applications, product type, and region. Analysis on Y-o-Y growth comparison, the market share comparison, and the revenue comparison coupled with relevant market numbers is offered in this chapter. Global market for actuators and valves has been regionally divided into Japan, Middle East & Africa, Europe, Asia-Pacific excluding Japan, North America, and Latin America. This analytical research report on the global actuators and valves market is a complete package, which includes intelligence on key participants underpinning the market expansion. In the last chapter of the report, which elucidates the competitive scenario of the market, strategies implemented by the market players, along with their product overview, company overview, key financials, key developments and SWOT analysis has been rendered exhaustively. In addition, region-wide spread of these market players, their future expansion plans, market shares, revenues, and mergers & acquisition activities between them have been described in detail in this concluding chapter of the report. An intensity map has been employed in the report to profile the market players situated across geographies. Credibility of the researched statistics and data is backed by the unique research methodology employed by the analysts at TMR, which ensures higher accuracy. TMR’s research report on the global actuators and valves market can assist its readers in gaining detailed insights on many different aspects governing the market around key regional segments included in the report. The report readers can further slate key strategies for tapping into vital revenue pockets and gaining benefits over the intensifying competition in the market. Information presented in the report has been scrutinized and monitored thoroughly by TMR’s industry experts. Figures and numbers offered in the report have also been validated by the analysts in order to facilitate strategic decision making for the report readers.